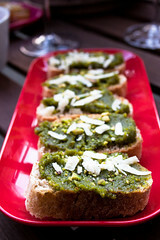 My first post is about one of my favourite recipes during summer: pesto. Appetizers, starters and main dishes are all possibilities with pesto. It’s easy to make, but so tasteful. 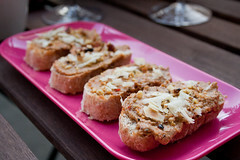 Give your guests for example some pieces of roasted bread and let them dip it in the pesto, another possibility is to make a bruschetta with pesto. The leftovers can be used to make a lovely pesto pasta for the next day. You can also make a gift basket for your guests, just put some pesto in a little bottle and add some grissini’s or pasta. Roast the nuts, be careful that you don’t burn them. I did it the first time J Chop the garlic in not so small pieces. Put them, together with the ricotta, sun dried tomatoes, basil, juice of sun dried tomatoes in a blender. Mix it. Add the nuts (do not use all your nuts, leave a little for the decoration. Mix again. If you want to make bruschetta’s, put the bread now in the oven. While your bread is in the oven, add the olive oil in the blender and mix it in. If it’s not creamy enough, you can add some more ricotta. Aren’t there enough tomatoes, put some more tomatoes in it. Is it too creamy, add more olive oil. Cut the ciabatta in slices. Put the slice in a preheated oven. Take the slices of bread out of the oven when they are crunchy (approximately 5 minutes). Put some pesto on top and finish with some cheese, fresh herbs like coriander or mint and nuts.